One of our most popular Dahlias ever! Its blooms are the colour of warm frothed milk. 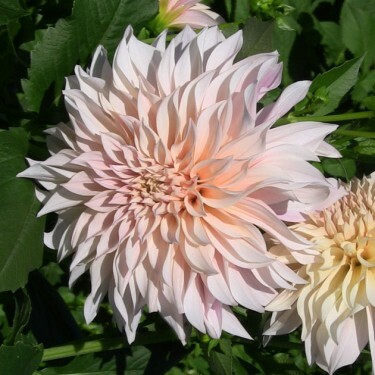 Café au Lait offers big creamy blooms that blend well with other colours. Are you looking for huge flowers? 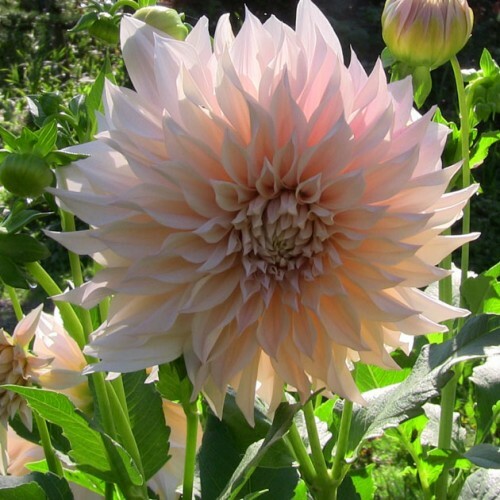 If so, then these extra large versions of the Decorative Dahlia are definitely the right choice. With flower heads the size of dinner plates (9-11 in, 23-28 cm) they're certainly a feast for the eyes! Originating from Mexico and Guatemala, these were the flowers of Inca kings and despite their royal origins Dahlias are amongst the easiest plants to grow in the garden. They are a wonderful source of cut flowers and will provide a veritable cornucopia of colourful blooms for your bouquets from mid summer until the first frost. Hardy as they are, Dahlias are susceptible to cold so be careful not to plant them too early and be sure to dig them up after the first frost and store them in a frost-free place.